Objective To identify a suitable dosing regimen of the CD22-targeted monoclonal antibody epratuzumab in adults with moderately to severely active systemic lupus erythematosus (SLE). Methods A phase IIb, multicentre, randomised controlled study (NCT00624351) was conducted with 227 patients (37–39 per arm) receiving either: placebo, epratuzumab 200 mg cumulative dose (cd) (100 mg every other week (EOW)), 800 mg cd (400 mg EOW), 2400 mg cd (600 mg weekly), 2400 mg cd (1200 mg EOW), or 3600 mg cd (1800 mg EOW). The primary endpoint (not powered for significance) was the week 12 responder rate measured using a novel composite endpoint, the British Isles Lupus Assessment Group (BILAG)-based Combined Lupus Assessment (BICLA). Results Proportion of responders was higher in all epratuzumab groups than with placebo (overall treatment effect test p=0.148). Exploratory pairwise analysis demonstrated clinical improvement in patients receiving a cd of 2400 mg epratuzumab (OR for 600 mg weekly vs placebo: 3.2 (95% CI 1.1 to 8.8), nominal p=0.03; OR for 1200 mg EOW vs placebo: 2.6 (0.9 to 7.1), nominal p=0.07). Post-hoc comparison of all 2400 mg cd patients versus placebo found an overall treatment effect (OR=2.9 (1.2 to 7.1), nominal p=0.02). Incidence of adverse events (AEs), serious AEs and infusion reactions was similar between epratuzumab and placebo groups, without decreases in immunoglobulin levels and only partial reduction in B-cell levels. Conclusions Treatment with epratuzumab 2400 mg cd was well tolerated in patients with moderately to severely active SLE, and associated with improvements in disease activity. Phase III studies are ongoing. Here we report the primary results of EMBLEM (NCT00624351), a 12-week, multicentre, phase IIb RCT that assessed the efficacy and safety of epratuzumab in patients with moderate-to-severe SLE disease activity using a novel composite primary endpoint, the BILAG-based Combined Lupus Assessment (BICLA).23 EMBLEM was designed to identify appropriate epratuzumab dosing regimens for study in phase III RCTs. All patients provided written informed consent. The trial recruited male or female patients aged ≥18 years with SLE diagnosis according to the revised classification criteria of the American College of Rheumatology and moderate-to-severe disease activity demonstrated by: (1) BILAG 2004 index24 ,25 level A disease activity in ≥1 organ/system except renal or central nervous system; or (2) BILAG 2004 index level B disease activity in ≥2 organs/systems if no level A disease activity was present and (3) a Systemic Lupus Erythematosus Disease Activity Index 2000 (SLEDAI-2K)26 total score ≥6. Before randomisation, BILAG data for individual subjects were reviewed and graded by an independent adjudication committee to ensure entry criteria were met. Other inclusion criteria included positive for antinuclear antibody at screening and receipt of corticosteroids (5–60 mg/day prednisone or equivalent) at a stable dose for ≥5 days before the first dose of study medication. If steroids were initiated or increased for treatment of the current disease flare, this must not have occurred >14 days prior to the first dose of study medication. Patients receiving antimalarials must have done so for ≥12 weeks. Doses of antimalarials and immunosuppressives must have been stable for ≥28 days prior to first dose, and unchanged throughout the study. Exclusion criteria included: active severe neuropsychiatric or renal manifestations of SLE (except mononeuritis multiplex of >4 weeks); pregnancy or lactation in females; active infection (including HIV or human T-cell lymphotropic virus type 1) or history of chronic infection; agammaglobulinemia; T-cell deficiencies; antiphospholipid antibody syndrome or use of oral anticoagulants or antiplatelet agents; malignancy (except treated non-melanoma skin cancers); significant haematologic abnormalities not attributed to SLE; vaccination during the study (except tetanus); and recent treatment with investigational monoclonal antibodies. Use of cyclophosphamide, cyclosporine, pimecrolimus, sirolimus or tacrolimus was prohibited. The trial was conducted between January 2008 and August 2009 at 47 centres in Belgium, Brazil, Hong Kong, Hungary, India, Lithuania, Poland, Spain, Ukraine, UK and USA in accordance with International Conference on Harmonization and US Food and Drug Administration (FDA) guidance on good clinical practise. The study protocol and informed consent forms were approved by each centre's independent ethics committee or institutional review board. After a 14-day screening, patients were randomly assigned to one of six treatment groups: placebo or epratuzumab 200 mg cumulative dose (cd) (100 mg every other week (EOW)), 800 mg cd (400 mg EOW), 2400 mg cd (600 mg weekly), 2400 mg cd (1200 mg EOW), or 3600 mg cd (1800 mg EOW). These regimens were selected based on results of the prior ALLEVIATE studies with the aim of identifying effective and ineffective doses. Randomisation was via an interactive voice response system and was stratified according to disease activity (presence/absence of BILAG level A disease) and use of concomitant immunosuppressives (yes/no). All patients, investigators and study staff were blinded to treatment with the exception of an independent data safety monitoring board. Epratuzumab (10 mg/ml) was prepared in glass vials for slow intravenous infusion with phosphate-buffered saline (PBS). Placebo was 0.04 M PBS, and was provided in vials identical in number and appearance to the epratuzumab vials. Patients were premedicated with 25–50 mg diphenhydramine and 500–1000 mg acetaminophen 30–60 min before each infusion. Infusions occurred at weeks 0, 1, 2 and 3; those randomised to epratuzumab EOW received placebo on weeks 1 and 3. The main time-points for postbaseline efficacy evaluations were weeks 4, 8 and 12. At study completion, patients were offered entry into a long-term, open-label study, or had a safety visit 12 weeks later. The primary endpoint was the responder rate at week 12 according to a composite endpoint, BICLA,23 that includes BILAG-2004,24 ,25 ,27 SLEDAI-2K,26 Physician Global Assessment of disease activity (PGA) and no treatment failure. The BILAG-2004 index was selected as the central score on the basis of its comprehensiveness, ability to capture partial improvement, and the clinical relevance of its scoring system. BILAG assessments were performed by the investigators, and grades were determined by an independent central reader group. Requirements for BICLA response were: (1) BILAG-2004 improvement (all A scores at baseline improved to B/C/D, and all B scores improved to C or D); (2) no worsening in disease activity (no new BILAG-2004 A scores and ≤1 new B score); (3) no worsening of total SLEDAI-2K score from baseline; (4) no significant deterioration (<10% worsening) in 100 mm visual analogue PGA and (5) no treatment failure (defined as non-protocol treatment, ie, new or increased immunosuppressives or antimalarials; or increased or parenteral corticosteroids; or premature discontinuation from study treatment). Following week 4, corticosteroid doses could be tapered off at the investigator's discretion, based on disease activity. Once tapered, corticosteroid doses could only be increased again to the dose preceding the last taper step; any larger increase was deemed a treatment failure. In addition, at no time was an increase of the corticosteroids dose above the baseline value allowed without meeting the definition of treatment failure. Secondary efficacy endpoints included BICLA response at week 8, BILAG improvement and enhanced BILAG improvement at week 12, and changes in mean total SLEDAI-2K scores and corticosteroid doses at week 12 versus baseline. BILAG improvement was defined as for the primary endpoint. Enhanced BILAG improvement, representative of quiescent disease, was defined as all BILAG A or B scores at study entry improved to C or D, with no new BILAG A score and ≤1 new B score in other organ systems. Adverse events (AEs) were coded according to Medical Dictionary for Regulatory Activities (MedDRA), V.8.0. Laboratory tests included haematology, serum chemistry and urinalysis, as well as SLE-associated parameters (eg, complement components 3 and 4 (C3 and C4) levels, human antihuman antibody (HAHA) levels, B-cell (CD20+) and T-cell (CD3+) numbers, and IgG, IgM, IgA and total immunoglobulin levels). B-cell surface levels of CD22 were assessed by flow cytometry. The trial was not powered to detect statistically significant differences between arms, but to detect clinical improvement and support pharmacokinetic/pharmacodynamic analyses. To achieve this, 30–35 patients per arm were required. The primary efficacy analysis comprised a logistic regression model of treatment response status (yes/no), which controlled for baseline disease activity (BILAG A presence/absence) and use of concomitant immunosuppressive agents at baseline (yes/no), and allowed estimation of the overall treatment effect of epratuzumab. Exploratory pairwise comparisons between individual epratuzumab dose arms and placebo were also defined, including OR, 95% CI and p values. The intention-to-treat (ITT) analysis included all randomised patients. The safety analysis included all ITT patients who received ≥1 dose of study medication. Overall, 227 patients were randomised and included in the ITT efficacy analyses (figure 1). Two patients in the epratuzumab 600 mg weekly arm were randomised but did not receive study medication and were excluded from safety analyses, although not from efficacy analyses. Patient characteristics, including demographics, disease severity and medication use were similar between treatment groups at baseline (table 1). Patient disposition (intention-to-treat population) through EMBLEM. At week 12, the responder rate in the placebo arm (21.1%) was lower than in the epratuzumab arms (figure 2A). The overall test of treatment effect was not statistically significant (p=0.148). However, exploratory pairwise analysis of responder rates demonstrated clinical improvements in patients receiving a cd of 2400 mg epratuzumab (OR for 600 mg weekly vs placebo: 3.2 (95% CI 1.1 to 8.8), p=0.03; OR for 1200 mg EOW vs placebo: 2.6 (95% CI 0.9 to 7.1), p=0.07). No notable improvements in response rates were observed with lower doses of epratuzumab (<2400 mg cd) or the 3600 mg cd (1800 mg EOW) dose. Further, the response rate in a post-hoc combined arm of all 74 patients who received epratuzumab 2400 mg cd (600 mg weekly or 1200 mg EOW) was higher than for placebo (OR 2.9 (1.2 to 7.1); nominal p=0.02) (figure 2A). Differences in BICLA response rates were seen as early as week 8 between patients receiving 2400 mg cd epratuzumab (600 mg weekly or 1200 mg EOW) and those in the placebo arm (figure 2B). No differences between the other epratuzumab arms and placebo were noted at week 8 (data not shown). BILAG-based Combined Lupus Assessment response rate (A) at week 12 (intention-to-treat analysis) for all patient groups (B) over weeks 1–12 for the 2400 mg combined dose arms compared with the placebo group. 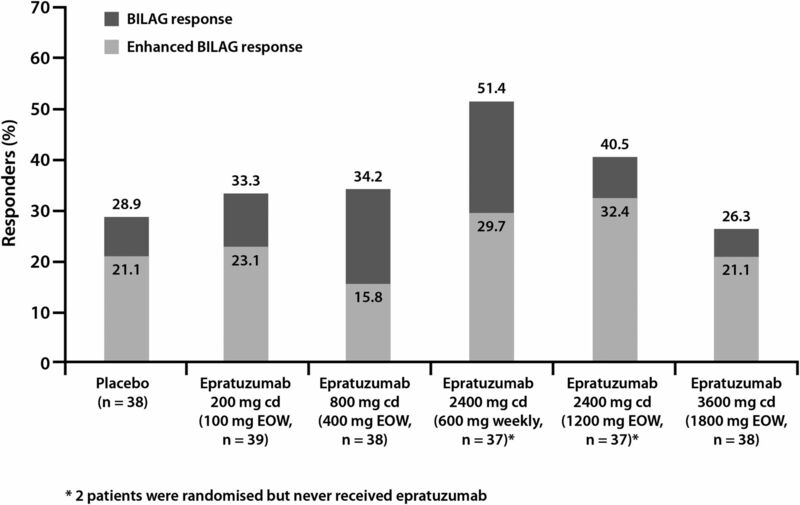 BILAG improvement at week 12 was greatest in the epratuzumab 600 mg weekly and 1200 mg EOW arms, with 51.4% and 40.5% of patients, respectively, showing BILAG or enhanced BILAG improvement, compared with 28.9% in the placebo arm (figure 3; all p>0.05). In analyses of the six body systems for which five or more patients per treatment arm had baseline disease activity that allowed assessment of response, resolution of BILAG system disease activity (BILAG A/B at baseline to BILAG D at week 12) was more common among patients treated with epratuzumab 600 mg weekly than among those receiving placebo: musculoskeletal (28.6% (10/35) vs 19.4% (6/31)); mucocutaneous (28.1% (9/32) vs 12.9% (4/31)); cardiorespiratory (100% (7/7) vs 29.4% (5/17)); neuropsychiatric (83.3% (5/6) vs 18.2% (2/11)), constitutional (100% (7/7) vs 77.8% (7/9)) and renal (33.3% (2/6) vs 0% (0/5)). Epratuzumab 1200 mg EOW was associated with greater BILAG system improvements than placebo in musculoskeletal (32.4% (11/34) vs 19.4% (6/31)), mucocutaneous (21.9% (7/32) vs 12.9% (4/31)), and neuropsychiatric (62.5% (5/8) vs 18.2% (2/11)) systems. The incidence of individual BILAG items within each body system was small and not evenly distributed between treatment arms, so is not further analysed here. Percentage of patients meeting criteria for BILAG improvement and enhanced BILAG improvement at week 12. Changes from baseline to week 12 in total SLEDAI-2K and PGA scores were also greatest in the 600 mg weekly and 1200 mg EOW arms, but not statistically significantly different from placebo. SLEDAI-2K mean±SD change from baseline in the placebo group was −5.6±6.2, compared with −3.2±5.0, 100 mg EOW; −3.6±5.5, 400 mg EOW; −6.3±5.7, 1200 mg EOW; −5.7±6.7, 600 mg weekly; and −3.2±6.7, 1800 mg EOW. PGA mean±SD change from baseline was −22.0±19.5 in the placebo group, compared with −12.3±21.9, 100 mg EOW, −11.8±24.2, 400 mg EOW; −14.4±17.6, 1200 mg EOW; −16.0±18.6, 600 mg weekly; and −13.2±19.3, 1800 mg EOW. Mean±SD changes in corticosteroid use (mg) at week 12 versus baseline were minimal: −2.0±5.5 (placebo); −3.4±9.2 (100 mg EOW); −1.7±4.1(400 mg EOW); −1.6±6.9 (1200 mg EOW);−0.3±4.0 (1800 mg EOW); and −0.9±7.4 (600 mg weekly). The subsets of patients in each arm receiving high doses (>30 mg/day) of corticosteroids showed the same distribution of responses as the overall treatment arms. The most common AEs across all arms were headache, nausea, upper respiratory tract infection and dizziness (table 2). Incidence rates of AEs, serious AEs (SAEs) and infusion reactions were similar across all arms and unrelated to epratuzumab dose. No effect of epratuzumab on standard laboratory parameters was observed. No deaths were reported. At week 12, no placebo-treated patients and four epratuzumab-treated patients met the criteria for a positive HAHA result (one receiving 100 mg weekly; three receiving 400 mg EOW). There was no discernible relationship between AEs and a positive HAHA result. Median levels of immunoglobulins stayed within normal levels, although mild/moderate increases in median IgA and IgG were observed over time with epratuzumab (see table in online supplementary material). At week 12, moderate reductions in B-cell counts relative to baseline were observed across all groups (figure 4A). Surface levels of CD22 on peripheral B cells were reduced in epratuzumab arms but not in patients receiving placebo (figure 4B). No consistent trends in T-cell counts were observed over time. No relationships between either autoantibodies or SLE-associated laboratory parameters (such as C3 and C4 levels) and treatment response were consistently observed. Changes from baseline in B-cell and CD22 levels. (A) Changes in absolute B-cell counts (cells/µl) (B) Changes in mean fluorescent intensity of CD22+ memory B cells. 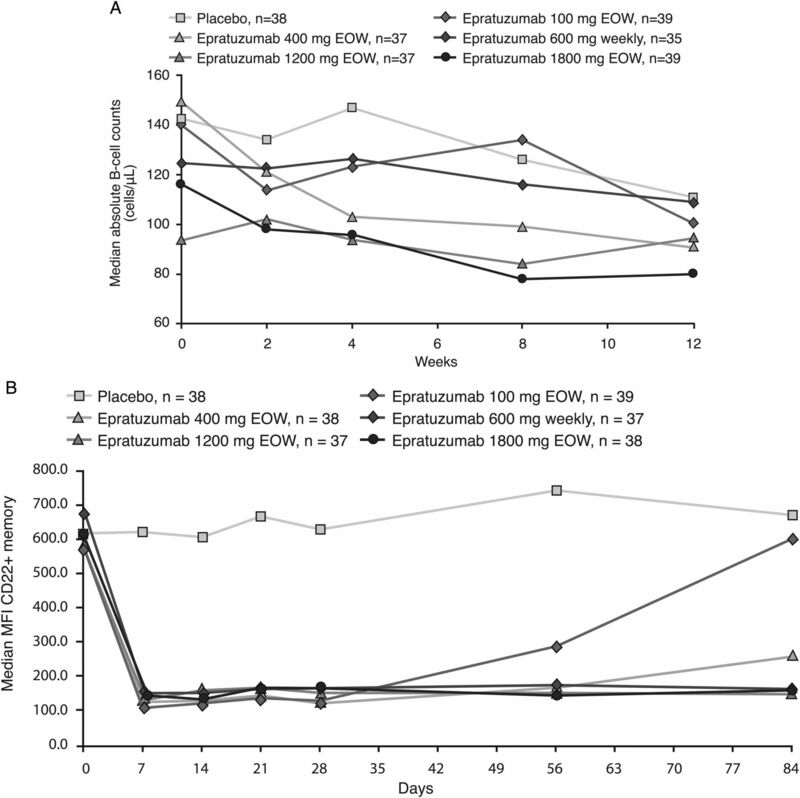 This placebo-controlled phase IIb trial aimed to identify an efficacious and well-tolerated dosing regimen for epratuzumab in patients with moderately to severely active SLE. The test of overall treatment effect was not significant; however, the sample size for this study was not chosen based on statistical powering requirements. Exploratory pairwise analysis using the BICLA endpoint found a higher proportion of responders in all arms than with placebo (23.7–45.9%, vs 21.1% placebo), but most notably there were clinical improvements in the 600 mg weekly (OR 3.2 (95% CI 1.1 to 8.8), nominal p=0.03) and 1200 mg EOW arms (OR 2.6 (95% CI 0.9 to 7.1), nominal p=0.07) and in a combined analysis of the two 2400 mg cd arms vs placebo (OR=2.9 (1.2 to 7.1), nominal p=0.02). The beneficial effects of 2400 mg cd epratuzumab could be observed as early as week 8. Epratuzumab was well tolerated, with similar incidences of AEs, SAEs and infusion reactions as placebo and decreases in immunoglobulin levels outside normal ranges or changes in laboratory parameters. These data build on the results of the ALLEVIATE trials, which provided preliminary evidence of the efficacy and safety of epratuzumab in patients with SLE.20–22 The BICLA composite endpoint used in EMBLEM was developed following an expert panel review of disease activity indices (DAIs) commonly used in SLE trials.23 BICLA is a robust, sensitive, composite, endpoint incorporating multiple DAIs, each of which emphasises different aspects of SLE activity. Composite endpoints have greater power than individual tools to identify differences between treatment groups, which is particularly useful in SLE, where patient populations are heterogeneous and disease progression is unpredictable.3 ,30 The BILAG-2004 index, used as the key component of BICLA in EMBLEM, is a comprehensive validated tool for assessing disease activity in all organ systems, and is capable of measuring incremental improvement.27 For a patient to be classified as a BICLA responder, improvements were required in all BILAG 2004 index organ systems affected by the disease at baseline, a relatively stringent response criterion. Notably, a low number of responders was observed in the placebo arm using the BICLA endpoint. Rules on background medication use were stringent, with any increase from baseline dose of immunosuppressives, corticosteroids or antimalarial medication at any time during the study classified as a treatment failure. Following week 4, corticosteroid doses could be tapered off gradually according to the investigator's assessment of disease activity. However, at week 12, changes from baseline in corticosteroid use were minimal across all arms, which may be because of the relatively low mean dose at baseline (13.7 mg) and/or the short duration of the study. Exploratory analyses showed that 600 mg weekly epratuzumab was associated with greater resolution of disease activity in BILAG 2004 systems than placebo in all six body systems that could be evaluated, including the cardiorespiratory and neuropsychiatric systems. The study was not of sufficient duration to assess the effects of epratuzumab on SLE-associated damage. Epratuzumab is one of a number of biological agents in development for the treatment of SLE. Major targets of these agents include B cells, T cells and cytokines.5 To date, however, success has been limited by the challenges associated with measurement of disease activity, the need for active background therapy in clinical trials, and the importance of avoiding changes or increases in background immunosuppressives and corticosteroids.4 ,5 ,31 Epratuzumab is the first CD22-specific treatment to be tested in clinical trials of SLE. In the EMBLEM trial, surface levels of CD22 on peripheral B cells were reduced in patients treated with epratuzumab, but not in those receiving placebo. In vitro studies have shown that epratuzumab induces CD22 phosphorylation and internalisation, which in turn leads to modulation of B-cell activity.15 Indeed, a decrease in the phosphorylation of Syk and phospholipase γ2a downstream signalling events following activation of the B-cell receptor, as well as inhibition of calcium flux, have been observed following epratuzumab treatment of B cells in vitro.18 Unlike rituximab, epratuzumab only partially reduces B-cell numbers and, therefore, it is possible to speculate that this agent may not be associated with decreases in immunoglobulin levels or an increased risk of infection.32 Indeed, no decreases in immunoglobulin levels outside normal ranges were observed during EMBLEM. Of note, some modulatory effects of epratuzumab on B-cell activity are specific to SLE patients, such that the in vitro proliferation of B cells is reduced by epratuzumab in SLE patients but not in normal subjects.16 Other studies have shown that epratuzumab modulates expression of the adhesion molecules CD62L, β7 and β1 integrin, and enhances the migration of CD27-negative naive B cells towards the chemokine CXCL12.17 Median B-cell counts decreased only moderately from baseline in the active-treatment arms of EMBLEM. Additional work is needed to fully define the mechanism of action of epratuzumab. The mechanisms responsible for the low response rate seen with the highest tested dose (3600 mg cd), although consistent with the results of the earlier ALLEVIATE studies, also require further investigation. High doses of epratuzumab may affect a specific function of B cells, a particular subset of B cells, the trafficking of B cells into different anatomical compartments and/or induce alternative signalling events not seen at lower doses. The results of the EMBLEM trial suggest that epratuzumab can improve SLE disease activity, and support continued development of this treatment. Phase III studies of epratuzumab have been initiated (NCT01261793; NCT01262365). These placebo-controlled studies will assess the efficacy and safety of both 2400 mg cd regimens in patients with moderately to severely active SLE over four 12-week treatment cycles. Such studies will also provide insights into factors such as the sustainability of treatment responses over time and the effects of epratuzumab on steroid use and quality of life. We wish to thank all the investigators, their staff and the patients that were involved with the study.
. Systemic lupus erythematosus. Lancet 2007;369:587–96.
. Systemic lupus erythematosus. N Engl J Med 2011;365: 2110–21.
. Understanding the epidemiology and progression of systemic lupus erythematosus. Semin Arthritis Rheum 2010;39:257–68.
. Why can't we find a new treatment for SLE? J Autoimmun 2009;32:223–30.
. New and emerging treatment approaches to lupus. Biologics 2010;4:263–71.
. B cells as therapeutic targets in SLE. Nat Rev Rheumatol 2010;6:326–37.
. Efficacy and safety of rituximab in subjects with active proliferative lupus nephritis (LN): results from the randomized, double-blind phase III LUNAR study. Arthritis Rheum 2009;60:S429.
. Efficacy and safety of rituximab in moderately-to-severely active systemic lupus erythematosus: the randomized, double-blind, phase II/III systemic lupus erythematosus evaluation of rituximab trial. 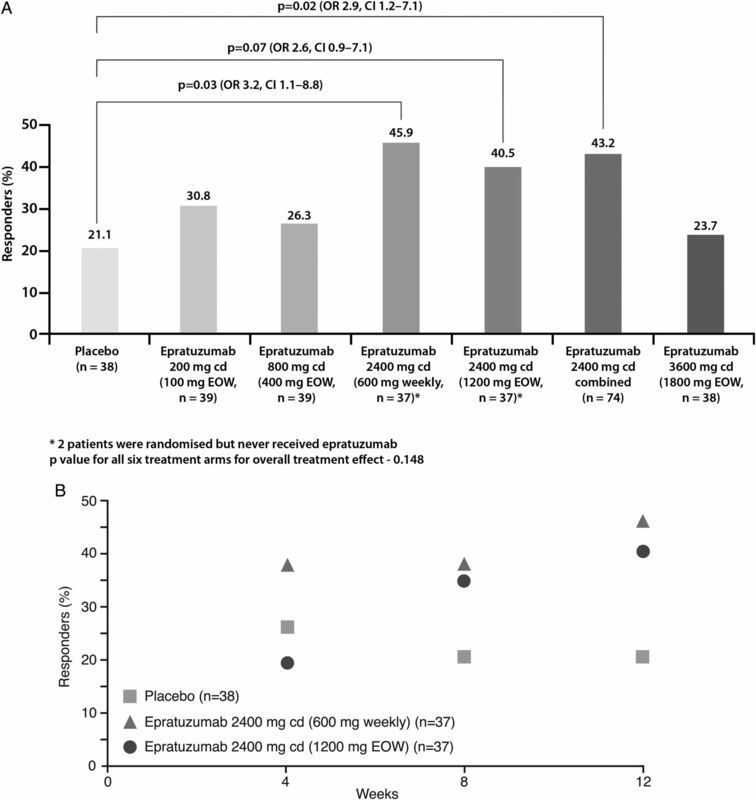 Arthritis Rheum 2010;62:222–33.
. Efficacy and safety of belimumab in patients with active systemic lupus erythematosus: a randomised, placebo-controlled, phase 3 trial. Lancet 2011;377:721–31.
. A phase III, randomized, placebo-controlled study of belimumab, a monoclonal antibody that inhibits B lymphocyte stimulator, in patients with systemic lupus erythematosus. Arthritis Rheum 2011;63:3918–30. HGS, GSK. Benlysta (belimumab) prescribing information. http://us.gsk.com/products/assets/us_benlysta.pdf (accessed Jan 2013). HGS, GSK. Belimumab: Summary of Product Characteristics. http://www.ema.europa.eu/docs/en_GB/document_library/EPAR_-_Product_Information/human/002015/WC500110150.pdf (accessed Jan 2013).
. B-cell targeting: a novel approach to immune intervention today and tomorrow. Expert Opin Biol Ther 2007;7:1287–99.
. Epratuzumab: targeting B-cell malignancies through CD22. Clin Cancer Res 2003;9:3991S–4S.
. Epratuzumab, a humanized monoclonal antibody targeting CD22: characterization of in vitro properties. Clin Cancer Res 2003;9:3982S–90S.
. Differential effects of epratuzumab on peripheral blood B cells of patients with systemic lupus erythematosus versus normal controls. Ann Rheum Dis 2008;67:450–7.
. Epratuzumab targeting of CD22 affects adhesion molecule expression and migration of B-cells in systemic lupus erythematosus. Arthritis Res Ther 2010;12:R204.
. Initial clinical trial of epratuzumab (humanized anti-CD22 antibody) for immunotherapy of systemic lupus erythematosus. Arthritis Res Ther 2006;8:R74.
. Clinically meaningful improvements with epratuzumab (anti-cd22 mab targeting b-cells) in patients (pts) with moderate/severe systemic lupus erythematosus (SLE) flares: results from 2 randomized controlled trials. Arthritis Rheum 2008;57(Suppl):1087.
. Meaningful improvements in health-related quality of life (HRQoL) with epratuzumab (anti-CD22 mAb targeting B cells) in patients (pts) with SLE with high disease activity: results from 2 randomised controlled trials (RCTs). Arthritis Rheum 2008;57(Suppl):1086.
. Epratuzumab (anti-CD22 mAb targeting B cells) provides clinically meaningful reductions in corticosteroids (CS) use with a favourable safety profile in patients with moderate/severe flaring SLE: results from randomised controlled trials (RCTs). Arthritis Rheum 2008;57(Suppl):1088.
. Evaluation of Treatment Success in Systemic Lupus Erythematosus Clinical Trials: Development of the British Isles Lupus Assessment Group-based Composite Lupus Assessment Endpoint. Presented at: ACR 2011: Poster 2265.
. Appendix H. Systemic Lupus Erythematosus: A companion to Rheumatology 2007:544–5.
. British Isles Lupus Assessment Group 2004 index is valid for assessment of disease activity in systemic lupus erythematosus. Arthritis Rheum 2007;56:4113–19.
. The BILAG-2004 index is sensitive to change for assessment of SLE disease activity. Rheumatology (Oxford) 2009;48:691–5.
. Numerical scoring for the Classic BILAG index. Rheumatology (Oxford) 2009;48:1548–52.
. Numerical scoring for the BILAG-2004 index. Rheumatology (Oxford) 2010;49:1665–9.
. Measuring outcomes in SLE clinical trials. Expert Rev Pharmacoecon Outcomes Res 2011;11:455–68.
. Generic versus disease-specific measures of health-related quality of life in systemic lupus erythematosus. J Rheumatol 2011;38:1821–3.
. Targeting CD22 as a strategy for treating systemic autoimmune diseases. Ther Clin Risk Manag 2007;3:953–9. Contributors DJW contributed to the design and execution of the study, interpretation of data and preparation of manuscript. He is the guarantor. KK contributed to the design and execution of the study, interpretation of data and preparation of the manuscript. VS contributed to the design and execution of the study, interpretation of data and preparation of the manuscript. FAH contributed to the design and execution of the study, interpretation of data and preparation of the manuscript. MP contributed to the design and execution of the study, interpretation of data and preparation of the manuscript. BK developed the statistical analysis plan, conducted analysis of the data and revised the manuscript. SB contributed to the analysis and interpretation of the data and development of the manuscript. AB contributed to the analysis and interpretation of the data, and development of the manuscript. LK contributed to the analysis and interpretation of the data, and development of the manuscript. CG contributed to the design and execution of the study, interpretation of data and preparation of the manuscript. Daphnee S Pushparajah contributed to the preparation and review of the manuscript. Funding This study was funded by UCB Pharma. Epratuzumab was licensed for non-oncology indications by UCB Pharma from Immunomedics, Inc. Medical writing support was provided by Niall Harrison and Liz Haygreen of Darwin Healthcare Communications and was funded by UCB Pharma. Ethics approval Approved by each participating centre's independent ethics committee or institutional review board. Data sharing statement The present manuscript reports all primary and secondary outcomes from the EMBLEM study. The CSR and full data tables are held by UCB Pharma, have been shared with manuscript authors, and are available on request to any study investigators.